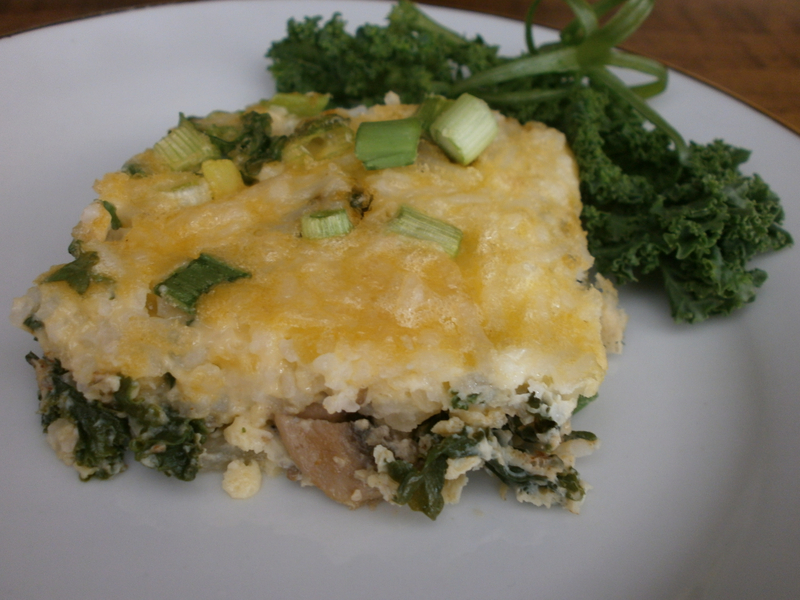 An egg casserole without cheese? Yes, it can exist, thanks to the creaminess of mayonnaise. Some cooks prefer to make their own mayonnaise, but I still buy mine in bulk. 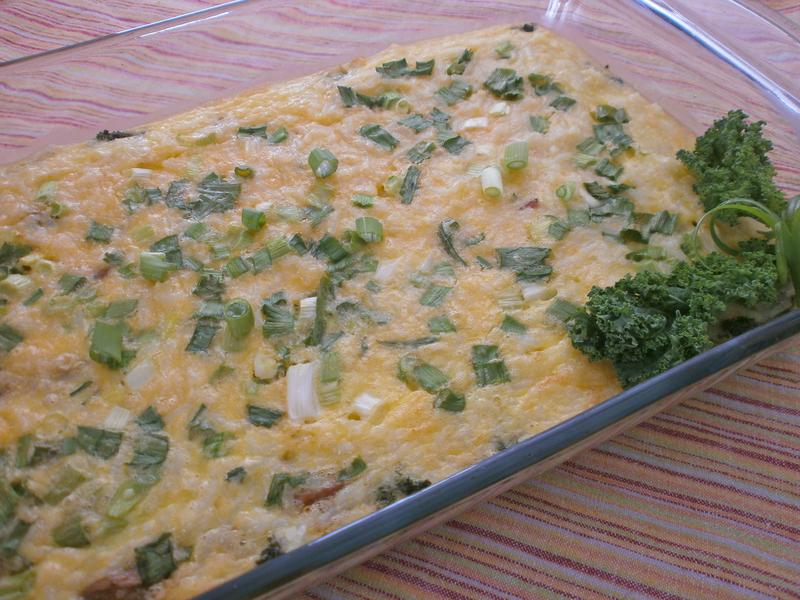 When I served a previous incarnation of this casserole at a group function, no one even seemed to miss the cheese. Should you have any diners that despise mushrooms, you may divide the casserole in half and swap out half of the mushrooms for zucchini, ham, or cooked sausage. I used one pan and arranged one side of the casserole to include mushrooms and one side without; to do this, I layered the casserole like a half-and-half pizza. The result was that for a few moments at least, harmony was achieved. *12 ounces of cooked pork sausage or cubed ham may be substituted for the mushrooms if you prefer. Preheat oven to 350 degrees F. Brown yellow onion in a medium saute pan. Add kale and saute until wilted. Transfer cooked kale and onions to a 2 quart baking dish. Add mushrooms to skillet and saute until tender. Add Italian spices and rubbed sage. Season to taste with garlic salt. Transfer mushrooms to baking dish. In a medium bowl, whisk together mayonnaise, mustard, salt, paprika and water (or rice milk). Add beaten eggs and whisk to blend. Stir in rice. Pour egg, mushroom (or meat) and rice mixture into the baking dish. Gently stir to evenly distribute ingredients. 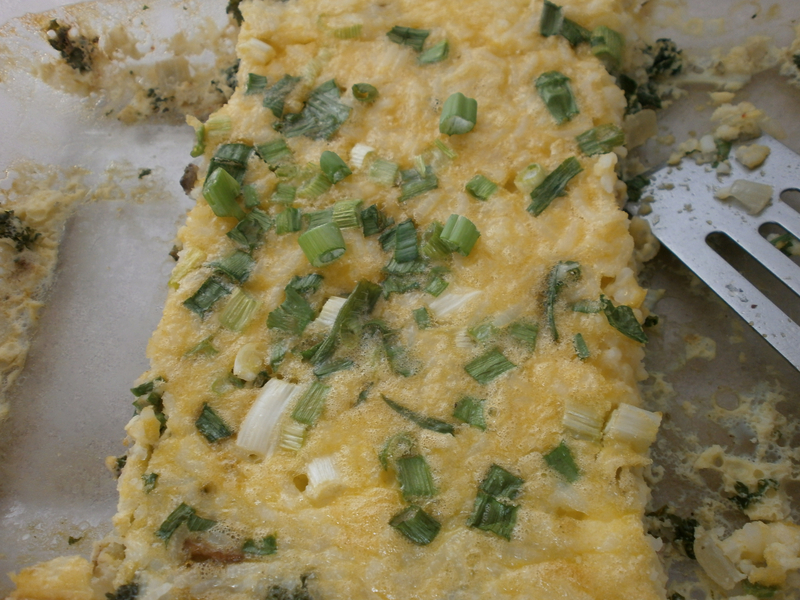 Top with chopped green onions. Bake at 350 F degrees for 30 minutes or until eggs are set in the middle. Find more healthy recipes at Pennywise Platter. I’m also sharing this recipe at Saturday Dishes. The ingredients don’t call for sausage but the instructions call for adding the sausage at the same time as the eggs. Please clarify. Thanks so much. The recipe sounds great. Sure, I am happy to clarify. If you want to avoid the mushrooms entirely, swap them out for cooked sausage or ham. The recipe now has an asterisk and a note about how much meat to use. When I made this, I used about 6 ounces of ham cubes on one side of the casserole and kept the mushrooms on the other side. I hope that makes sense now. Thanks for your question!